I’ve seen several recent posts wondering about an intuitive explanation for the fact that “a minus times a minus equal to a plus”. I understand why people would wonder about this—the way it’s often taught, it seems to be just an arbitrary rule with no “why”! But in fact, it’s quite logical. Paul at crossedstreams.com gives an explanation involving two quantities with real-world interpretations associated with negative values: net worth (negative means a decrease in net worth), and time (the past is negative). It’s fairly intuitive, but in some sense it only shows why it is nice that a minus times a minus is a plus, since it allows us to model this real-world situation; it doesn’t really show why it is true in a deep sense. Mike at Walking Randomly gives a proof essentially from the field axioms, but (as he himself admits) it is not particularly intuitive. Here’s how I would explain it. It isn’t rigorous at all, and I’m not even completely satisfied with it, but I hope it is helpful for building some intuition. 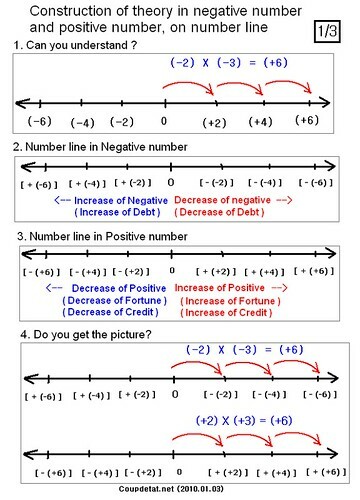 Think about the familiar “number line”: positive numbers go off to the right, and negative numbers are to the left. Adding a positive number corresponds to moving right along the number line. Adding a negative number (that is, subtracting a positive one) corresponds to moving left along the number line. So with addition we already see this idea of negative corresponding to doing something “in the opposite direction”. So, what does multiplication correspond to on the number line? Of course, multiplication corresponds to scaling, or stretching: for example, if we start at a point on the number line and multiply by 3, we will end up at a point three times as far from zero as we started. And what about multiplying by a negative number? It corresponds to a scale in the other direction: for example, if we start at a point on the number line and multiply by -3, we end up at a point on the other side of zero, and three times as far. That is, multiplying by a negative number means that we flip from one side of zero to the other. So, of course if we start from the left of zero (a negative number) and multiply by a negative, we end up on the right of zero (a positive number)! [As an afterthought, I think trying to explain it any more deeply than this really does require bringing in the distributive property in some way—it is the only thing that formally connects addition (remember, negative numbers are defined as additive inverses) and multiplication. I really like the idea posted by Eric as a comment on Mike’s post regarding an illustration of the distributive property. 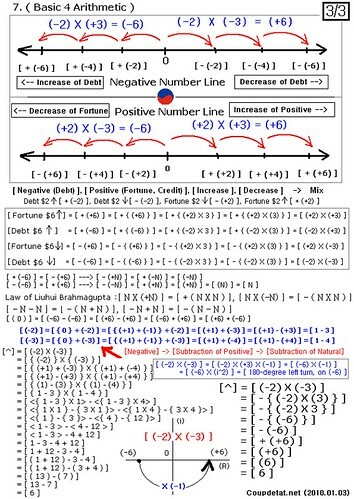 This entry was posted in arithmetic and tagged intuition, multiplication, negative. Bookmark the permalink. I used to explain the fact “- x – = +” using the construction of Z out of N, at the same time explaining why this construction (N x N modulo equivalence) captures pretty natural our sense of negative numbers. I think the next question to your explanation would be: why is multiplication with -1 a reflection on the number line? When a factor decreases by 1, the product decreases by the amount of the other factor. Here all the products will decrease by 3. Now we can apply the same pattern, only to the other factor. The product will now decrease by -3, or increase by 3. I like this because it is a pattern that is both easy to see and obviously true. I had never seen your reasoning before, and I like it too. Trouble with explaining it as a scaling operation is that while multiplying m by +n moves you by m(n-1), multiplying by -n moves you by m(n+1). Or alternatively, people might think that if multiplying by +n puts you n times further away from the origin, maybe multiplying by -n should put you n times *closer* – that is, it should represent division. Shades of raising something to a -ve power here. JM: I like it, thanks! David: all good points. This is why I think ultimately an explanation in terms of distributivity is the only really satisfying answer. If our sceptic accepts that – * + = – then to get the sign rule, distributivity is not needed. so -X * -Y is +ve for any X and Y. This seems way too complex but the basic argument “if -*- wasn’t + inverses would be impossible” works intuitively. I don’t think you can get rid of the scaling factor without distributivity or a rule like |a*b| = |a|*|b| or even just -1 * 1 = -1 (are all of these equivalent to distributivity given all the other axioms, they seem a little weaker) Otherwise it could be that -1 * -1 = 16. This could be true if the the object you write as “-1” is the object usually called “-4”. I don’t think you run into any contradiction if you do that (and you leave out the distributive axiom), just confusion. YinYang is not (ONE dimension) but (THREE dimensions). YinYang can not be explained and can not be proved, by Number Line. 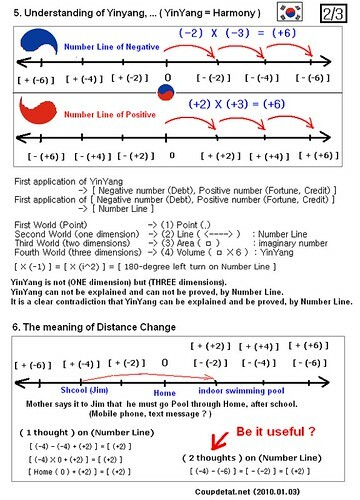 It is a clear contradiction that YinYang can be explained and be proved, by Number Line. Then as soon as you continue the progression to k negative, the result is obvious.